Inquire about our Summer Breeding Special! > 54% of his Registered Cria are show winners. Emperor Basil is a spectacular male with amazing fiber. He is square and boxy, with correct conformation and proportion. His beautiful dark brown fiber is bright with a soft hand, consistent character and great density. He's done great in the show ring, with judges calling him the "total Package" and commenting that his fiber "knocks their socks off". He has a sweet personality and a laid back disposition. Emperor's sire is the incredible Legend's Challenger of KPR, who is a LSG offspring of the legendary 5Peruvian Royal Inca Legend, now deceased. Legend's Challenger is producing spectacular, Champion alpacas all across the country. This would be a great way to acquire those sought after genetics by breeding to this amazing Herdsire. Emperor is producing award winning offspring and future herdsires! He is stamping his phenotype on all of his offspring with incredible fleece and that perfect compact conformation! 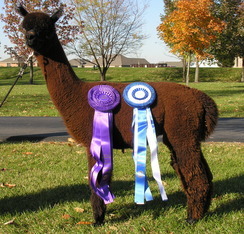 Check out Emperor's crias, he has several ribbon winners and many more to come. He currently has 25 registered offspring. Watch for them in the fall and spring show ring! 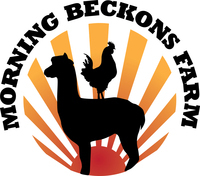 Morning Beckons Farm offers $500 down for breedings and the remaining fee when the cria is registered. We include free transport of Dam (up to 300 miles), 60 days of free board, and 2 ultrasounds to confirm pregnancy. Please ask us for a copy of terms and conditions.